The parks listed below provide visitors with an opportunity to walk their dog however your dogs must remain on the designated walking trails and on a lead. One of the main reasons dog access is restricted in national parks is to protect native animals but it is also important for your dog’s safety. Here are our Top 17 dog-friendly parks and walks in metropolitan Adelaide for you to explore with your furry friends. 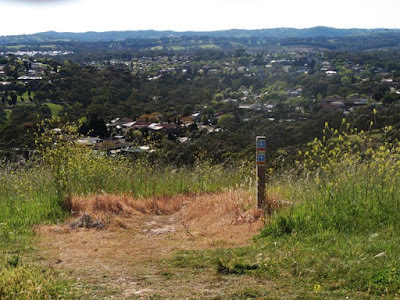 About 16km north-east of the Adelaide CBD, Anstey Hill at Tea Tree Gully offers unique experiences for walkers, including beautiful displays of wildflowers dotted along the trails and the extensive ruins of a 19th-century nursery. Be sure to visit in spring when the wildflowers and orchids are in bloom. Anstey Hill Recreation Park conserves rare vegetation once widespread throughout the Adelaide Plains and Mount Lofty Ranges. There are currently no marked trails, but rather named interconnecting tracks including Ellis Way – Kaurna Way – Lookout Walk – Newman’s Track – Water Gully Track – Boundary Track. Acccess: Starting from gate 20 on North East Road. There is limited on-road parking near the entrance. Located in the Adelaide Hills (13km south of Adelaide), Belair National Park is an ideal place to get active outdoors with beautiful natural bushland and featuring numerous picnic areas, tennis courts and walking trails. Waterfall Hike (6.5km return) is the most challenging trail in the park: it takes you through Echo Tunnel and to the picturesque rock escarpments of the Upper and Lower Waterfalls. Take care at both waterfalls, the escarpment lookouts are not fenced and can be slippery near the cliff edge. Most of the trail is on dedicated walking trail, but a few short sections near the lower end of Queen Jubilee Drive are on fire track, and are shared trails with cyclists. You can walk your dog in this park providing it remains under your control on a lead. Access: Upper Sturt Road, Belair, SA, 5052. The trail starts at the Pines area. The large stone monument about half a kilometre along Brownhill Creek Road in Mitcham signifies the start of the Recreation Park. Another 100m along and a small car park arrives on the left with a trailhead providing details of the park and the trails. 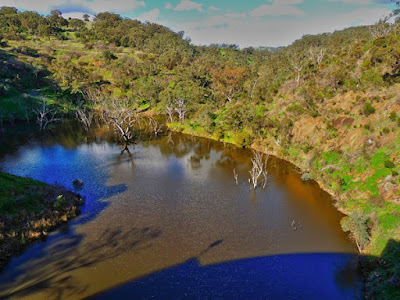 The 5.4km moderate Wirraparinga Trail Loop meanders along the Brownhill Creek valley, through Brownhill Creek Recreation Park. A narrow creek flows through the steep-sided valley, with majestic river red gums, some more than 300 years old. The Wirraparinga Trail traverses the southern side of the valley, and the Shared Use Trail the northern side along the creek. You can easily combine the two trails into a loop, starting at the caravan park and turning around at the Manure Pits. 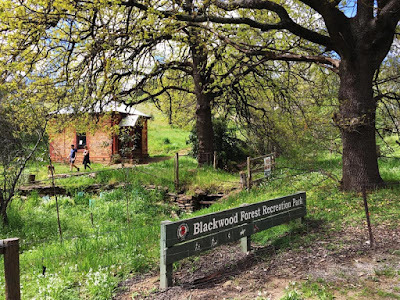 The Porosa Hike follows some of the original farm tracks, and a tranquil path through the valley of Cobbler Creek among stately river red gums. Along the way you will find rewarding views of the Adelaide Hills and surrounding plains from the hilltop near Teakles Ruin, as well as the site of the historic ‘Trevalsa’ homestead. 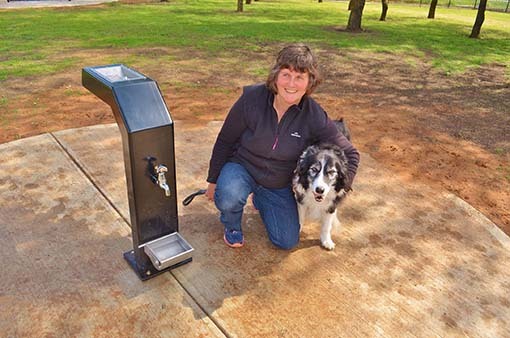 Dogs are welcome on designated dog walking trails within the Cobbler Creek Recreation Park. Access: Smith Road carpark (Porosa hike) or the carpark at the base of the Grove Way, just up from the Bridge Rd intersection for other trails. 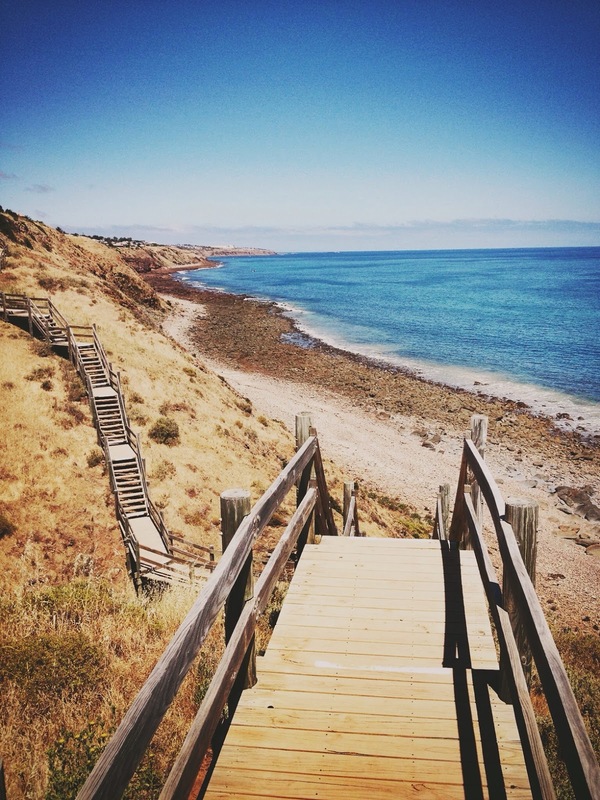 Marino Conservation Park is located 18km south of Adelaide and conserves the last remaining stands of coastal heath vegetation along this part of the coast. 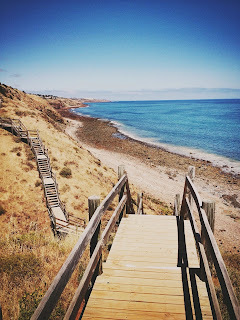 The walking trail and fire access tracks allow you to explore the park, taking in its stunning scenic views over Brighton, Glenelg, Grange and the Marino Rocks Lighthouse. 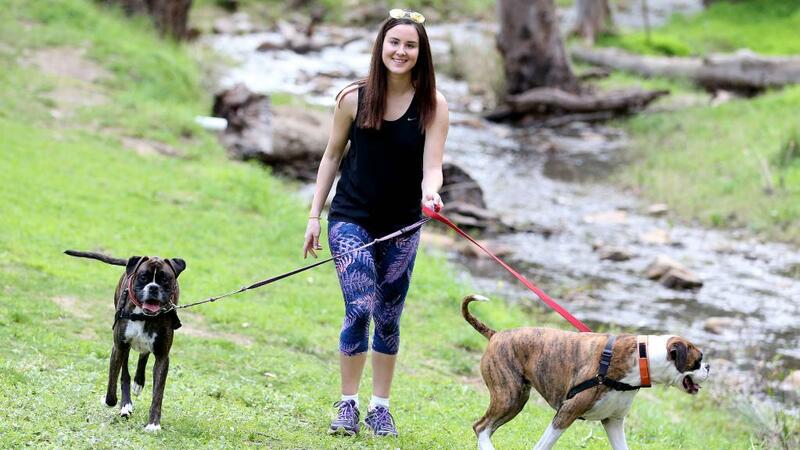 Dogs are welcome on designated dog walking trails. Access: Car parking is available on Nimboya Road at Marino and there are three pedestrian access points. 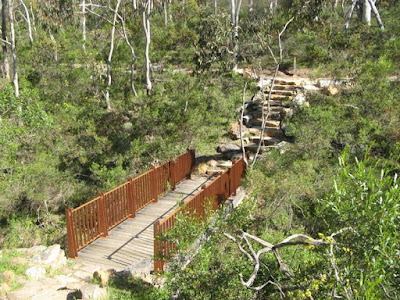 Morialta Conservation Park is a protected area 10 km north-east of Adelaide city centre. Dog walking in Morialta Conservation Park is currently allowed along Morialta Falls Rd to the Morialta Falls car park but is banned in Black Hill. Mount George Conservation Park is perhaps one of the less accessible parks in Adelaide's metropolitan area but it rewards its visitors with some splendid scenery in the Adelaide Hills. 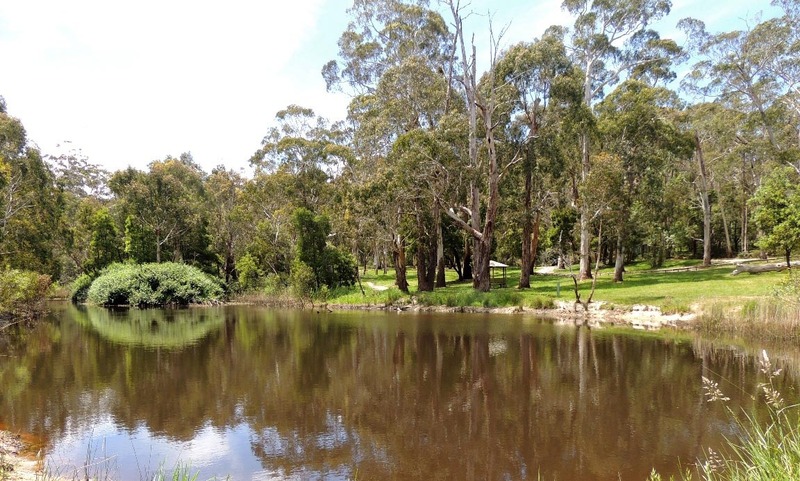 Situated near Bridgewater, the park borders the South Eastern Freeway and is accessible by car via the narrow unsealed Mount George Road. Dogs are permitted in the recreation park on leash only in the area between Cox Creek and Mount George road but not in the conservation zone of this park. You will find a car park, shelter and picnic tables but there are no toilets or other facilities. 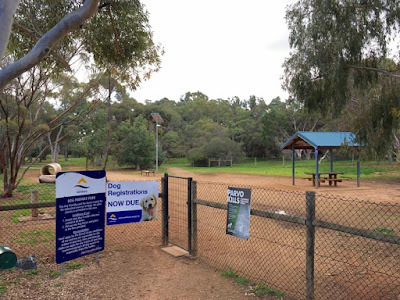 O'Halloran Hill Recreation Park is a protected area located about 16 kilometres south of the Adelaide city centre in the suburbs of Seaview Downs and O’Halloran Hill. It can be explored via its network of walking trails, horse riding trails and fire tracks. Shade from the regenerated grey box eucalypts and river red gums provide the perfect spot for a picnic. Parra Wirra Recreation Park is the perfect place for immersing yourself in nature – for walking, picnicking, and observing native animal life. The park is also home to the Barossa Goldfields, where you can discover the ruins and the history of a once thriving mining operation. You can see kangaroos grazing at dawn and dusk, and on a warm day bearded dragons and sleepy lizards bask in the sunshine. If you’re in luck you might also spot a short-beaked echidna, a shy creature whose diggings can be found throughout the park. 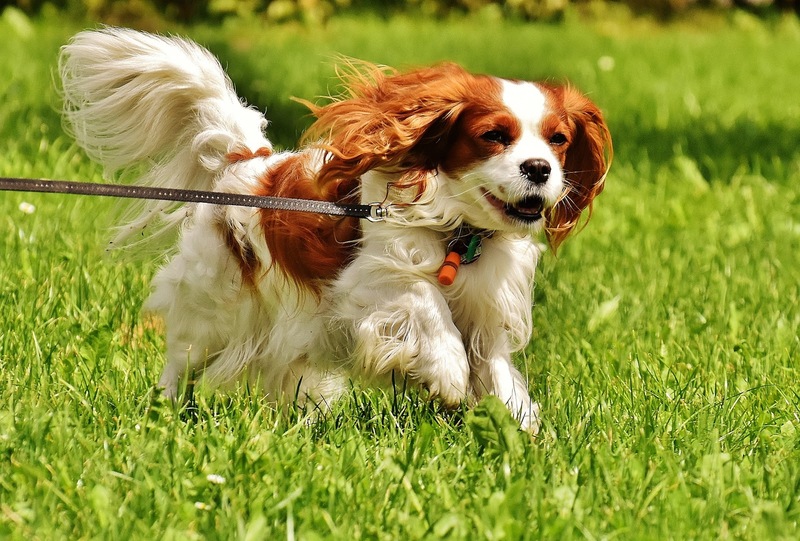 You and your dog can enjoy this park providing you keep your dog on a lead and under your control at all times. Shepherds Hill Recreation Park is located 11km south of Adelaide. This suburban park holds some unexpected attractions. Come and discover the magnificent remnant grey box eucalypts environment and take in the 360 degree views of the surrounding Adelaide plains, coastline and hills. Access: via Ayliffes Road, St Marys and Ellis Avenue, Eden Hills. Located 13km South of Adelaide, the Sturt Gorge Recreation Park offers 244 hectares of densely vegetated hill slopes and open space, stretching from Craigburn Farm in the east to Flagstaff Hill. Internationally recognised as an area of conservation and geological significance this park conserves the nationally threatened Greybox Grassy Woodland vegetation and is home to a rock formation known as Sturt tillite believed to have formed 800 million years ago. 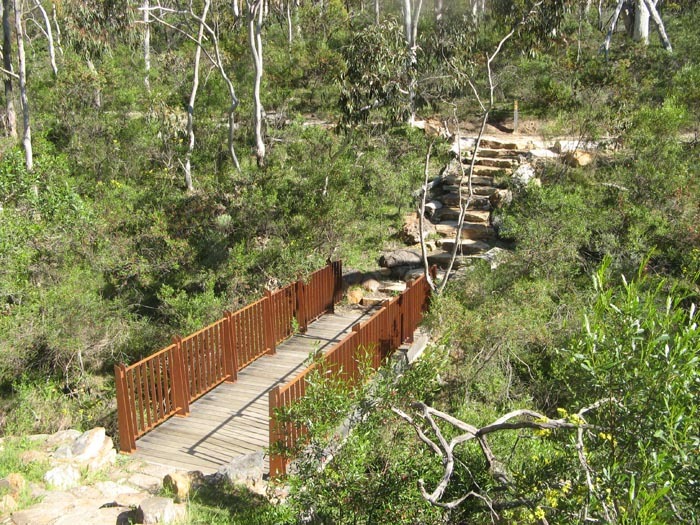 The walking trails in the Sturt Gorge range from the 400m Parrianna Trail (a short descent from Broadmeadows Drive to the spring-fed falls of the Sturt river) to the to 8km River Trail with the option of combining trails to customise your walk to suit your time constraints and fitness level. Access to the Sturt Gorge Reserve is 24/7 and dogs on a lead are welcome. There are no facilities in the reserve, so remember to take enough water and poop bags for your adventures. Access: Gate 12, Broadmeadow Drive, Flagstaff Hill, SA, 5159. There are several places to begin the various trails. located in the Mt. Lofty Ranges suburb of Hawthorndene, 12km south of Adelaide. As long as your dogs remain under effective control they are welcome to explore this park off lead. There are plenty of paths to follow and some great historical buildings to discover. Access: corner of Main Road and Turners Avenue, Hawthorndene, SA, 5051. Four Paws Park is inside Dennis Morrissey Park. Fourth Creek runs through the Park, providing a tranquil setting where your dog can play while the rest of the family enjoys and picnic or plays on the playground equipment. This is a wonderful dedicated dog park, with a well-appointed, circular dog agility section, a dog drinking fountain, seating for us humans and public toilets. It is also one of the only off-leash parks in South Australia that has lighting. 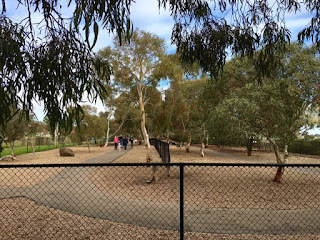 Adjacent to the fenced dog park, there is a large oval where your dog can run off-leash (under control) and a separate fenced playground for children. Access: car park off St Bernards Road, Hectorville, SA, 5073. This park is a fully fenced area, designed specifically for dog exercise. It features dog obstacles suited to novices through to advanced dogs. Features include shade, seating, drinking water for dogs, poopa bags and bins. The linear layout is like a walking circuit (most do it clockwise) with the entrance and exit located side by side. Access: Bicentennial Drive, Golden Grove, SA, 5125. This park offers two separate areas in a secluded setting and is generally closed at sunset. 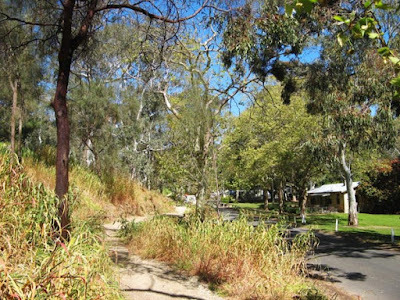 Jenkins Reserve offers good walks along the Little Para, with an adjacent car park. 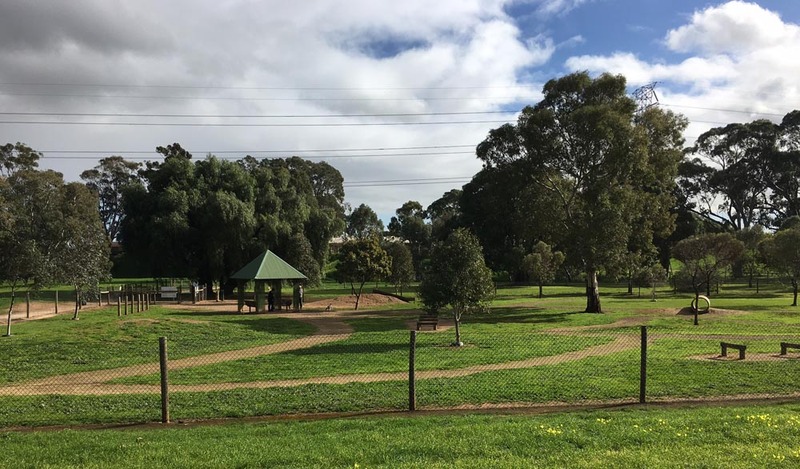 This reserve in Trott Park features a dedicated dog park which opened in September 2016, a playground, picnic area with BBQ and shelter, and a grassed kickabout area. This is a massive boomerang-shaped dog park - essentially creating two spaces - with inner biodiversity area. Access: two car parks, entrance via either Adams Rd or Reserve St. 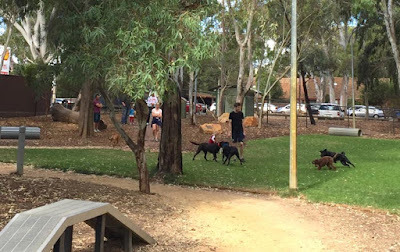 The Paddocks Dog Park is found within The Paddocks Reserve in Salisbury. The park itself boasts a unique layout and is divided into two areas for owners to explore with their dogs. One half is wide and open, with tunnels, tables, seating and agility equipment for dogs that want to play. The other half is full of trees and is more enclosed, for dogs to spend more solitary exploring time. Outside of the park there are numerous walking trails through the scrub, leading the way through to wetlands, picnic areas and sports fields. Please remember that you must have your dog on a leash in these areas. Did we leave out your favourite place? Please share your walking experiences around Adelaide in the comments below.